Join GRC experts Michael Rasmussen, Principal Analyst at GRC 20/20, and Dave Rusher, SVP Product Strategy & Alliances at Aravo, as they present an Executive Insights Series on managing Third Party Risk and Compliance. Please enjoy podcast sessions 2 & 3, links below. For more information about Aravo solutions for Third Party Risk Management, please contact us. 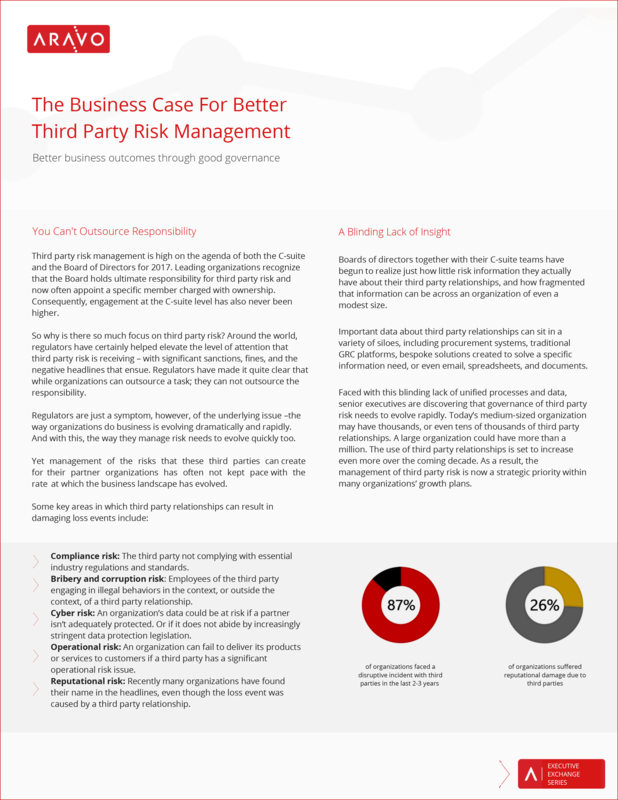 For a comprehensive examination into the business motivations that drive a successful business case for TPRM, read our complete White Paper The Business Case For Better Third Party Risk Management - Better business outcomes through good governance.